Spinach (Spinacia oleracea) is annual or biennial plant with juicy green leaves rich with chlorophyll. It is a rich source of minerals, vitamins, pigments and phytonutrients. All of these together make spinach very beneficial for a number of vital processes. Due to the vast range of benefits from this vegetable, it is advisable to consume spinach on a regular basis. Spinach is a member of the Aramanthaceae family. One of the biggest reasons why spinach is so important and valued around the world is that it is very durable. It can even survive through the winter and be just as healthy in the spring. There are 1400 milligrams mineral matters in 100 grams of spinach. The plant is rich with magnesium (56 grams), iron, potassium, sodium, phosphorus, manganese, iodine, cobalt. It is remarkably rich with vitamins, especially Vitamin C (60 milligrams) and contains all the vitamins of group B. The presence of carotenoids provides valuable presence of provitamin A. Other important elements, including thiamine and riboflavin, which are used in various reactions in our body, are also found in spinach. Spinach is also rich in pigments like beta carotene, lutein, xanthene, and chlorophyllin. The best part is that spinach has a low fat content. Spinach offers a wide range of benefits to most of our physiological processes, whether consumed in raw or cooked form. The caloric value per 100 grams is not greater than 22 kcal because it contains a large amount protein, carbohydrates and fat. It has been used in various parts of the world as a medicinal plant specifically included in cooking to help increase overall health. Let’s take a closer look at why this leafy vegetable is such an integral part of our overall health. Reduces Hypertension – Spinach has a very high content of potassium and a low content of sodium. This composition of minerals is very beneficial for high blood pressure patients as potassium lowers and sodium raises the blood pressure. The folate present in spinach also contributes to the reduction of hypertension and relaxes blood vessels, while maintaining proper blood flow. By reducing blood pressure and relaxing the tension of vessels and arteries, you can reduce stress on the cardiovascular system and increase oxygenation to the body’s organ systems for optimal functionality. Prevents Cancer – Spinach is rich in flavonoids- a phytonutrient with anti-cancer properties. Thus, it has been found to be effective in slowing down cell division in human stomach and skin cancer cells. Moreover, it has proven to be effective in providing protection against the occurrence of aggressive prostate cancer. Treats Atherosclerosis – Atherosclerosis is caused due to the hardening of the arteries. A pigment called lutein that is found in spinach has been shown to reduce the occurrence of atherosclerosis, heart attacks, and strokes. This is due to the fact that spinach proteins tend to reduce the cholesterol and other fat deposits in the blood vessels. 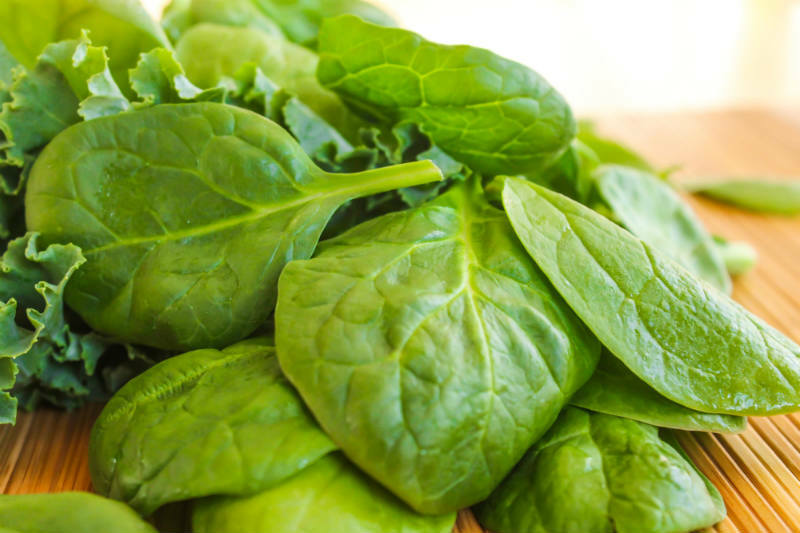 Lowers Risk of Cataracts – The lutein and zeaxanthin present in spinach both act as strong antioxidants, thus preventing the eyes from the harsh effects of UV rays that can lead to cataracts. They also reduce the impact of free radicals, which can be a major cause of cataracts and other eye conditions. Anti-inflammatory Properties – This leafy green contains Neoxanthin and violaxanthin, the two anti-inflammatory epoxyxanthophylls that regulate inflammation. Thus, it is beneficial in preventing inflammatory diseases such as arthritis, osteoporosis, migraine headaches and asthma. Prevents Anaemia – Regular consumption of spinach can prevent anaemia as it is an excellent source of iron. This mineral is particularly important for menstruating women and growing children and adolescents. Moreover, it is much better than red meat as it provides a lot less calories and is fat and cholesterol free. Iron is also needed for good energy as it is a component of haemoglobin which carries oxygen to all cells of the body. Helps with Weight Loss – Spinach leaves help in weight reduction as it is low in calories and fat. It is very nutritious and has a good quality of fat soluble dietary fibre. This fibre aids in digestion, prevents constipation, maintains low blood sugar and curbs overeating. Thus, this leafy vegetable is often recommended to dieters because in dieting, it is important to avoid repetitive eating. Improves Digestion – Consuming more spinach promotes gastrointestinal health. The beta-carotene and vitamin C present in it protect the cells of the body’s colon from the harmful effects of free radicals. Besides, folate prevents DNA damage and mutations in colon cells. Promotes Hair Growth – It is a super food comprising of vitamins B, C and E, potassium, calcium, iron, magnesium and omega-3 fatty acids all of which are required for healthy hair growth. Iron helps the red blood cells carry oxygen to hair follicles which is essential for healthy hair growth and strong strands. Relaxes the Body – Keeps the body relaxed and completely stress free. It contains tremendous amounts of zinc and magnesium which enable you to sleep better at night, thus making way for more effective healing. Magnesium helps in replenishing your lost energy within seconds. A good quality sleep rests your tired eyes, thus relaxing your body as a whole. Pour 2 dl of boiling water into a cup with one palm leaf spinach. Leave it covered for 10 minutes and then strain. Drink one cup 3 times a day before meals. This tea stimulates urination and relieves pain in inflamed bladder. It improves the function of the liver and the digestive system. Each heat treatment reduces biological value of the food. So eat fresh fruits and vegetables every day. Use young leaves of spinach for the salad and refine with chopped garlic, lemon juice and olive oil.